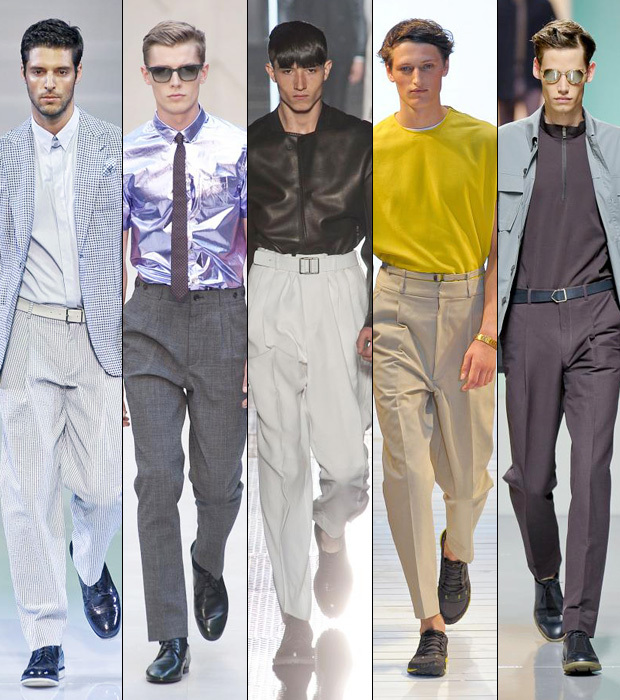 Loose pants are all over the place and the latest collections all over are full of generously proportioned pants. Metro Men – Style Shrink! The one thing constant in the world of pants is change. Just when you think you’ve nailed a style, a new one pushes it firmly out of favor. In the Seventies you’d be silly to be seen in anything but flared bottoms; in the Eighties – pleated and baggy; the Nineties kept things straight and narrow and by the time the Noughties rolled around, you were modern and edgy if you owned a wardrobe full of skinnies. Today, proportions are changing again, and things are heading in the direction of roomy. Loose pants are all over the place and the latest collections all over are full of generously proportioned pants. Choose relaxed tailoring with eastern-inspired drapes or mix smart, fitted jackets with loose, flowing trousers. So, yes, volume is certainly back. As for the formal trousers, pleats work as well as the flat-front. Flat-fronts have always been around, most often seen on that wardrobe staple – khakis, and are also great for a more casual-contemporary vibe. Pleated trousers are a gentleman’s classic and traditionally considered to be dressier than flat-fronts. Whatever you do, though, leave the zoot suit behind in the Forties, please. You are not Frank Sinatra. Don’t take your cues from the runway; collections are showcased on tall, reed-thin models. The thing to remember is: pleated pants add volume to your waist; if you’re generously endowed in those parts, avoid them. Also shorter legs look even shorter in baggy, pleated styles. The other thing to ensure when choosing a pleated style is that the pleats fall in a straight line from the waist to the hem. If they open up, go a size up or try a different style. -Pastels are out and saturated color is having its moment. Sport blindingly bright pieces, an unexpected diversion from the muted aesthetic that is commonly worn. When in doubt, restrict all that color to a T-shirt and combine it with a neutral suit in black, white or grey. -Fashion is moving eastwards, so expect to see Asian-inspired fashion with sharp accessories. –Metallics will be hard to miss this year. They’re already everywhere. Even easy summer pieces carry the snap of all things shiny. If the top half of your outfit is shiny, balance it out with bottoms in matte shades, and vice-versa. -While plenty of camouflage and geometrical prints are having their moment in the sun, floral prints are here to stay. Think big – broken, graphic blooms or faded, dreamy patterns – in crisp cotton under linen and cotton blazers. -Layering clothes enables you to dress to the right degree and is not just limited to the winters. Keep the pieces thinner and lighter in spring. Play with varied lengths and transparency and put longer graphic sleeves layered under short-sleeve shirts. Don’t play it up with too many bright colors and end up looking like spray painted canvas. -Micro checked blazers, checked suits – checks this season come in all sizes. Scale up, scale down, your choice. -Ditching the rules, use drawstring waistlines (borrowed from trusty track pants) and inject some fun into a serious grey suit. Luxe sport is the way to go. -The flashing of ankles is the new normal. Accept it. Cropped pants are a great way to survive warm summers, as well as steer clear of puddles in the rains. And if you want to cause quite a stir, reinvent the suit by cutting off the hems of suit pants. Go sockless with this trend for maximum effect. -Little touches make a big difference: a natty hat, striking shoes, a modish bag or statement sunglasses. Remember a sharp suit alone is never enough.